Perfectly steamed hot rice… Nothing could be better for dinner! And if you’re cooking for two or a solo meal, all you really need is a small rice cooker to make it happen. A rice cooker is essential if you want to avoid overcooking rice but it’s much more versatile than you think. If you haven’t discovered it yet, you should know that can do a lot of things with your rice cookers. This includes creating your own steam dumplings and vegetables. Of course, slow cookers can cook rice as well but it’s a lot simpler to use one that’s specially designed for rice. Take a look at our selection of the best small rice cookers and how you should pick the best one for your kitchen. 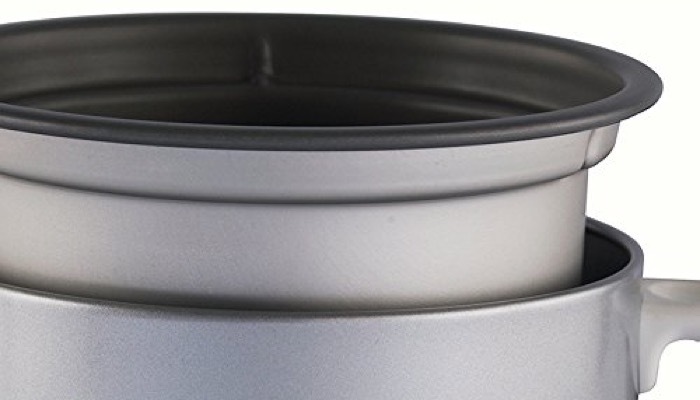 Number one on our list is the Panasonic 1.5-Cup Automatic Rice Cooker, Silver. It produces 3 cups of cooked rice which you can do with just one simple switch. This small rice cooker is automatic so all you have to do is to measure your rice, put the appropriate amount of water, and turn it on. After about 30 minutes, you’ll have perfectly cooked rice, ready to eat! It features a durable nonstick aluminum coated pan so the heat is evenly distributed. This material also makes the cooker easy to clean after use. You don’t have to deal with rice sticking obnoxiously to the sides. It includes a very useful measuring cup so you get the right measurement each time. 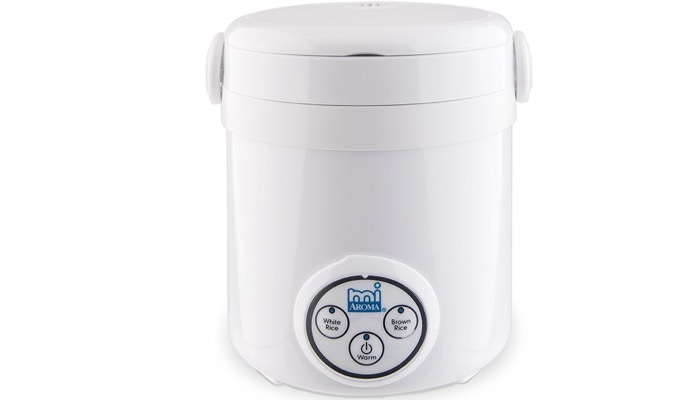 Next on our list is the Aroma Housewares Mi 3-Cup (Cooked) (1.5-Cup UNCOOKED) Digital Cool-Touch Mini Rice Cooker. It has a really nice mini design that would fit on small counters. The top lifts up and snaps down so you can easily transport it from one area of your kitchen to another or straight to the dining table. If convenience is your priority, this small rice cooker is perfect. It features programmable digital controls so you don’t have to worry about setting the right time and overcooking your rice. 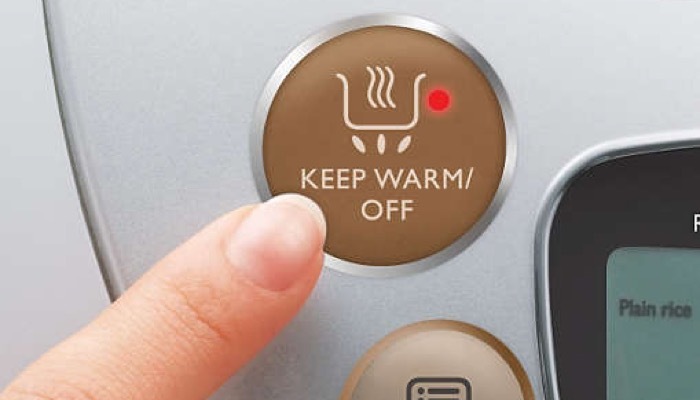 The automatic keep warm feature allows your rice to remain warm after cooking which helps if you want to cook rice in advance. Its most unique feature is its brown rice function since there is a slight difference in cooking brown rice. 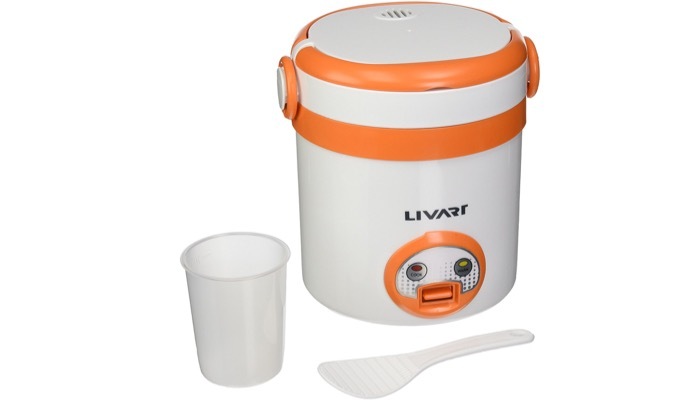 If you don’t cook rice often and don’t really want to store any leftovers, you should consider the Livart Rice Cooker / Warmer 1 Cup. Unlike the first two models, this small rice cooker has a capacity of 1 cup uncooked rice which produces 2 cups of cooked rice. It’s just right for one or two meals and perfect for people living alone as well as couples. This model features a single switch operation which makes cooking rice a breeze. It also has a warm function so you can keep your rice for a few hours without it getting cold. The pan is nonstick so it’s very easy to clean. 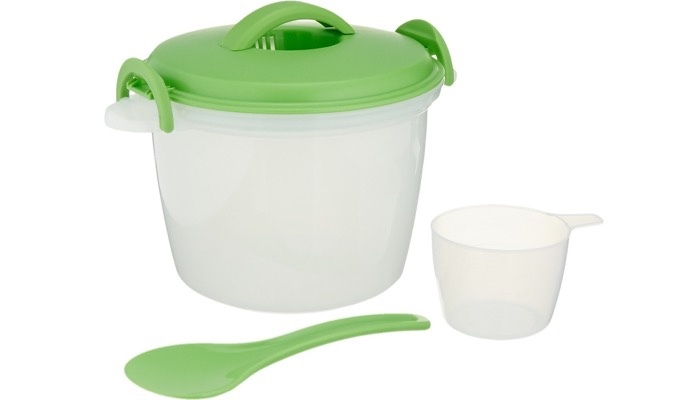 It includes a side dish container that you can use as a lunch box so it’s great for professionals who bring their own meals to work. If you already have a microwave oven at home, the Prep Solutions by Progressive Rice Cooker, 4 Piece Set – 6 Cup Capacity is a fantastic affordable solution! It comes at an incredibly low price and allows you to cook rice by putting the cooker inside your microwave. It cooks up to 3 cups of rice which is 6 cups of cooked rice. This small rice cooker is an innovative kitchen tool that makes food preparation simple and easy. The set includes a locking lid for keeping your rice warm after cooking, a rice paddle, and a handy measuring cup. It’s a great solution for people on a budget who want to enjoy rice! 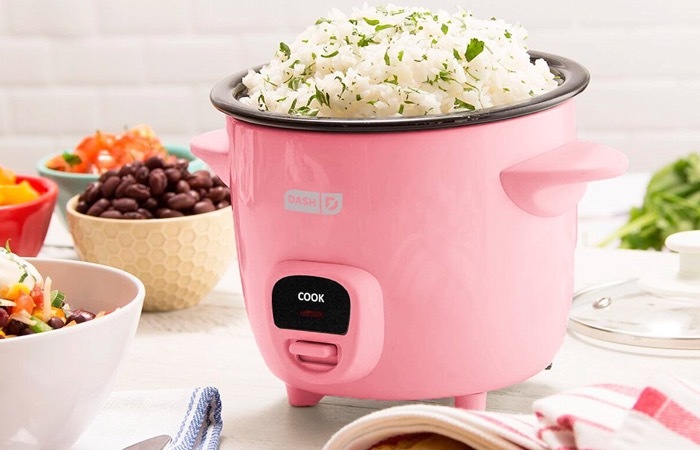 Whether you just occasionally eat rice or it’s part of your daily meals, it’s important that your small rice cooker includes the most essential features to ensure that your rice is perfectly cooked at all times. Here are the things that you should look for. Some small rice cooker models feature on-off cooking which means that the cooker will automatically shut off once the rice has been cooked. You usually see an indicator light to tell you that it’s done. This is a great option if you usually consume the rice right away. Otherwise, you might need the keep warm feature. For those who need to cook rice in advance and want their rice to stay warm until the next meal, choose a cooker that has a keep warm feature. It maintains the rice at a warm temperature as long as it’s turned on. It will only stop warming once you pull the plug. Choose a small rice cooker with a nonstick coating. This is important because rice can get really sticky which makes the pan difficult to clean. It would require you to submerge the pan in hot water for a while before you can remove the rice. With a nonstick inner pan, you can skip this procedure and simply clean it with a sponge and dishwashing liquid. Rice cookers can also steam certain foods like dumplings and vegetables. It’s a great plus if your small rice cooker also comes with accessories such as steamer trays. You can steam while the rice is cooking. Another useful feature that you should look for, especially if you have a small space, is that the exterior of the rice cooker remains cool to the touch while the rice is cooking. Cooking rice is made a lot faster and simpler with the help of rice cookers. Our list above includes a diverse collection of models so you can choose depending on your needs. 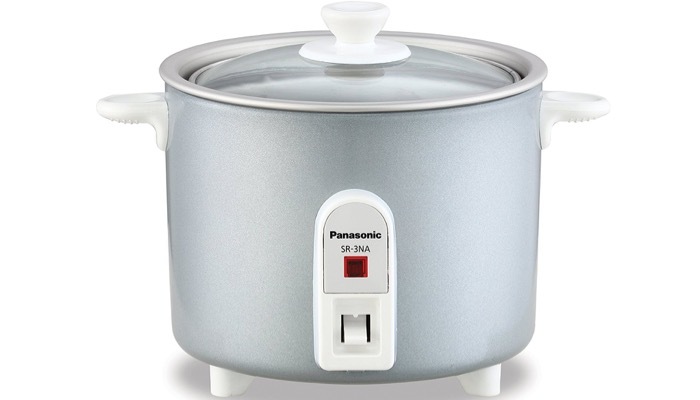 We like the Panasonic 1.5-Cup Automatic Rice Cooker the best for its ease of use, versatility, and durability.